If a fire occurred in your home tonight, would your family get out safely? Everyone must know what to do and where to go when the smoke alarm sounds. 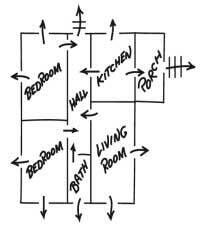 We encourage you to take a few minutes with everyone in your household to make a home fire escape plan, following the instructions below. Draw a plan for each level of your home, showing two ways out of every room, if possible. Draw in all the doors, windows and stairways. This will show all possible escape routes at a glance. Include any features, such as the roof of a garage or porch that would help in your escape. The door will be the main exit from each room; however if the door is blocked by smoke or fire, identify an alternate escape route, which could be a window. Make sure all windows open easily and everyone knows how to escape through the windows to safety. Windows with security bars should have quick-releasing devices. Choose a meeting place which is a safe distance from your home and one that everyone will remember. A tree, street light or a neighbour’s home are all good choices. In case of fire, everyone will go directly to this meeting place where they can be accounted for. Don’t waste valuable seconds calling 911 from inside your home. Once you have safely escaped, call 911 from a cell phone or a neighbour’s home.